See the world's largest choreographed fountain performing in front of thousands, to the rhythm of 'Flying Drum' by Vertical Orchestra. 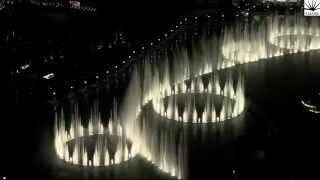 The Dubai Fountain, Downtown Dubai Performs Lana Allah. Burj Khalifa Downtown Dubai New Year's Celebrations 2014 #bethere. 42nd Uae National Day Parade At Downtown Dubai.